EDDU translates as buckwheat in Breton language. Eddu Silver has its roots at the heart of Brittany; it is the only whisky in the world which has been produced from buckwheat only. This pure buckwheat Breton whisky has been crafted with 80% of non malted buckwheat and 20% of malted buckwheat, a combination that brings added fruitiness to the spirit. With a beautiful old gold colour and copper reflects, the nose is marked with fruity notes of citruses, fresh fruits, with a floral scent of rose and heather. 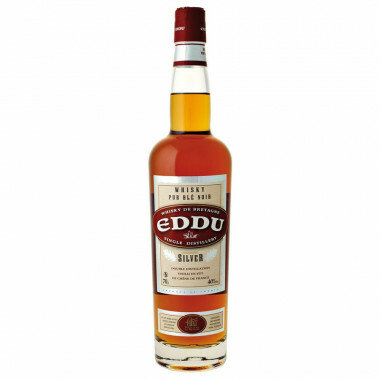 The palate shows dashing fruitiness (apple) and evolves onto spices and quite refined oaky flavours. The finish is beautifully refreshing, for a well-balanced, fruity overall. Located in Brittany (near Quimper), the Distillerie des Menhirs of Plomelin stands out for its originality. Indeed, it transforms black wheat and apples to cider, both emblematic productions of Brittany, into a range of whiskeys, spirits and high-quality cider. Guillaume, the son of Francès, became a known figure as local distiller in the public workshop of Pont-Menhir, Plomelin. So as for his son René. Francès, Guillaume, René.. Guy almost broke the family legacy training as a maths teacher. But the distillation gene took over and Guy came back on the track laid down by his ancestors. In 1986, Guy and his wife planted orchards and built in Pont Menhir their own distillery, hoping to manufacture a new spirit, unheard of in Brittany: The Pommeau des Menhirs, which would become the first Pommeau in Brittany to bear an Appelation of Controlled Origin. Colour: old gold with copper reflects. Nose: Intense, complex. Fruity (citrus fruits, fresh fruits) and floral (rose, heather). Palate: deep fruitiness, original, (apple, ripe plums). Spices (pepper, cinnamon). Refined oak flavours. Finish: a beautiful sensation of freshness. A well-balanced, fruity overall. Lavish and smooth. - On the rocks, reveals notes of candied apricot, citrus fruits and ripe plums.